The 2005 Bali 9s footy tournament has been cancelled in the wake of the terrorist bombings last weekend that killed at least 22 people on the popular holiday island. The 2005 Ontario AFL premiership has been decided, with minor premiers the Toronto Downtown Dingos going on to win the Grand Final over finals surprise Lakeshore. It would have been a fairytale finish for the Rebels, who came from 5th on the ladder to challenge for the flag. In the Preliminary Final they knocked off traditional powerhouse the Toronto Eagles 70 points to 37, after having beaten Etobicoke by less than a goal the week before. That knocked Etobicoke out of the finals, with successive losses of less than one straight kick. The Dingos' path to the premiership decider was easier, with a bye for finishing top then a win then another week's rest. However the Dingos' victory over the Eagles was by just 7 points, so Lakeshore had every reason to think they were a chance of an upset in the Grand Final, and it certainly went down to the wire. The US Army side out of Fort Irwin in California launched their new website a few weeks back. Check out the Mojave Greens. Australia has recently seen a surge in African migration, and no doubt footy administrators will be keen to see some of these new arrivals embracing Australia's national football code. One such potential recruit is Mayong Akoon, a 15 year old Sudanese boy who started playing footy in the school yard 4 years ago with friends and has now been picked up by the Calder Cannons in Victoria's elite under 18 competition. US power club the Denver Bulldogs have won their fourth-straight national title at the US Nationals held in Milwaukee on the weekend. Denver defeated Milwaukee in the Division One Final 4.8.32 to 1.1.7, although San Diego notably also performed very strongly in the group. In Division 2, the Golden Gate Roos defeated Philadelphia 7.3.45 to 1.4.10 - Orange County narrowly missing the Division 2 final after originally being seeded in division 1. Division 3 saw a strong Vancouver side miss out on the final after a border-crossing delay stopped them arriving for their first match - Minnesota eventually defeating Baton Rouge 4.3.27 to 3.3.21 for the title. Every so often a few guys stranded in a city without footy go looking for like-minded individuals and get a kick-to-kick happening. 'Every so often' is slowly but surely becoming more regular and kick-to-kick is turning to clubs looking for a game. In the past few months Europe has seen three, possibly four new teams hoping to get off the ground, with the Trolls in Oslo and Lions in Finland, the Czech Republic and the Swedish city Linköping. After a successful first year in its 2004 season, the Scottish Australian Rules Football League (SARFL) is building up for the finale to its second season with a Grand Final set to be played in Edinburgh on 22 October. The Scots also have big plans for the future, hoping to put a 3-year plan in place to enter the International Cup in 2008. Nominations are now rolling in for the 2006 VFL Barassi International Youth Tournament in Canberra in 2006 and the organisers are putting the word out for any interested groups to register their interest - whether it be an elite squad or just a school team who want to visit Australia, suitable opposition will be found. 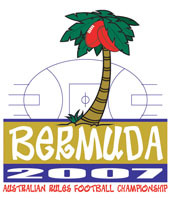 Aussie Rules is coming to Bermuda, and the Atlanta Kookaburras, Reading Kangaroos (UK) and Bermuda Department of Tourism will use the the USAFL National conference on Friday and the USAFL National Championships on Saturday to launch The Bermuda Australian Rules Football Championships to be held April 2007. Melbourne Football Club players and officials have commenced post-season volunteer work on the Thai island of Koh Phi Phi, where they are constructing a school as a memorial to former teammate Troy Broadbridge. Troy was tragically killed in the Boxing Day tsunami last December.